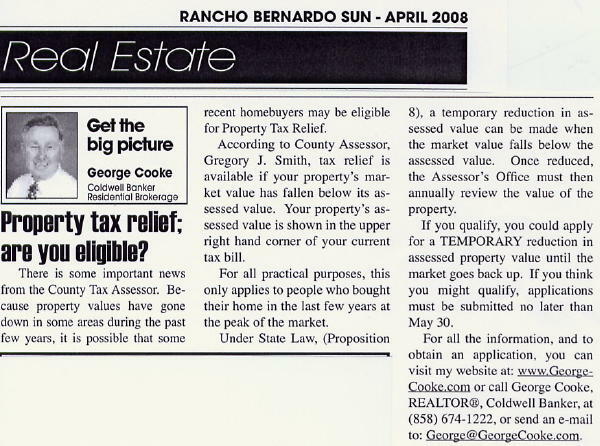 Has the market value of your property fallen below your assessed value as shown on your property tax bill? The County Assessor has informed property owners that tax relief may be available if their property's market value has fallen below its assessed value. Your property's assessed value is shown in the upper right hand corner of your current tax bill. For all practical purposes, this only affects those property owners who purchased their property at the height of the current real estate market. Under State Law, (Proposition 8) a temporary reduction in assessed value can be made when the market value falls below the assessed value. Once reduced, the Assessor's Office must then annually review the value of the property. When the property values increase, the assessed value will also be increased but no higher than the original assessed value (plus the annual CPI increase, not to exceed 2%, as required by Proposition 13). If you think you may be eligible, you need to file an Application of Review for Assessment. For more information about this and other Property Tax issues, please visit the County Assessor's website at www.sdarcc.com. If you have any questions involving this process or the current market conditions, you can call George at (858) 674-1222 or send an email to George@GeorgeCooke.com.